Body, breath and consciousness are tightly linked. Yoga philosophy has regularity; this means that a person comes to spiritual practice gradually. It is a journey that begins in the body and brings to the soul. Therefore, in our school we practice asanas, which is the third stage of Patanjali 8 level system. Yoga possesses intelligence „outside the time”, which is not related to the number of years; therefore, people can no longer be psychologically affected by the cult of youth of today. 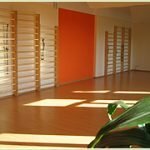 Iyengar method has become famous in particular with the approach to customize asana or position for each individual person’s body and health characteristics. Various props – blankets, ropes and belts, blocks, etc. are used during the classes. Therefore asanas give the best possible effect, not risking health, resulting in increased physical strength, flexibility, persistence and balance. In addition props are of utmost role in restorative poses which calm and arrange the mind, while renewing strength and energy. After the class, you will be able to go home full of energy, but at the same time peaceful and balanced. Gradually range of your motions will increase that you need on a daily basis. Posture and breathing will improve, which by the time will heal all the body without pills. Your intellectual horizons and psychological stability will expand. You will be happy for every day and moment. Start to practice with us! GURUJI – B.K.S. Iyengar has classified 200 types of yoga asanas (positions) and 14 types of pranayama (breathing) techniques. Asanas are grouped and structured from simpler to very complex, in the way that the beginners and practitioners would be able to practice effectively. The Iyengar yoga method is respected and practiced in a great many countries of the world.